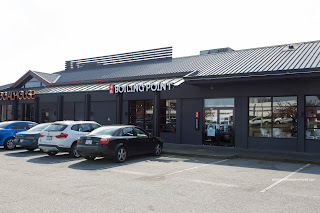 The last time I visited a Boiling Point, it was for late night eats at the Burnaby location. 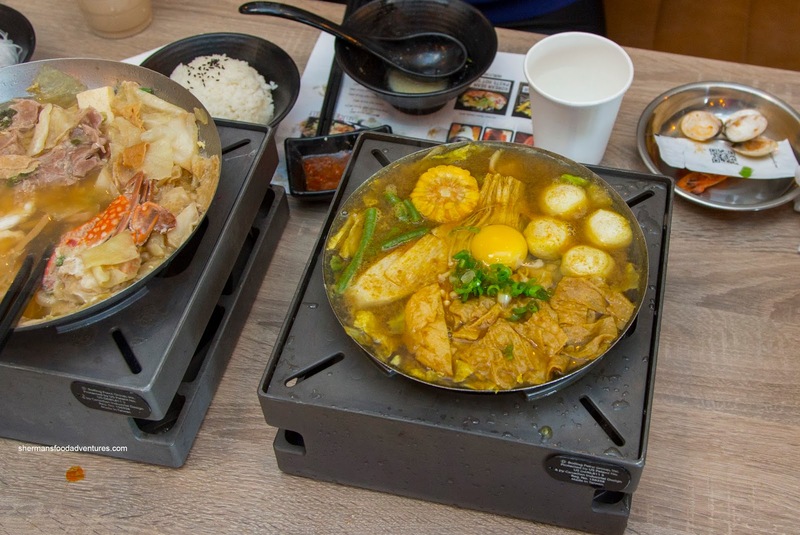 As much as the hot pots were fairly good, I felt that the standard versions were a better value than the more expensive deluxe hot pots. One thing that limited my thoughts about the place was that we only tried 3 versions. However, with a ChineseBites tasting for the newly opened Surrey location, this was the perfect opportunity to try practically all of the available options, including 2 new flavours as well. I ended up sitting at a table with Rick, Diana and Grace as we shared 8 hot pots. To kick things off, we had 2 appies including the Kimchi Tofu. I guess this was a play on the Taiwanese tofu dish with preserved egg on top, but employing kimchi instead. This was a non-offensive and pleasant enough starter, but it wasn't exactly that interesting. 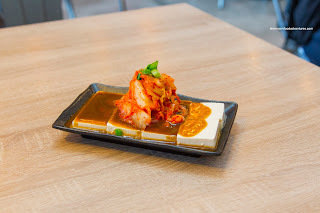 The individual components were fine as the tofu was soft while the kimchi was tart with some spice. Next up, the Garlic Pork Belly looked rather ordinary and plain. How wrong was I as this was a tasty offering. 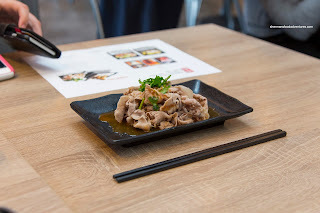 The tender thinly-sliced pork belly was bathed in as sauce that was very garlicky, sweet and somewhat spicy. It was a flavour explosion in my mouth. 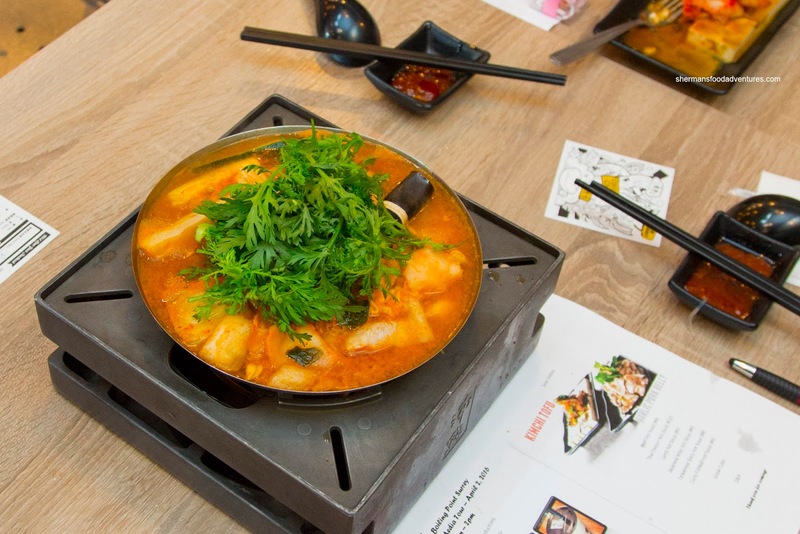 Onto our first hot pot, we gave a new flavour a try in the Pomelo. Now I was expecting a certain amount of tang from the broth, but this ended up to be overly sour. I personally love sour things like vinegar, lemon juice and sour candies, but this was too much for me. I really couldn't taste anything else other than a faint background sweetness. As for the ingredients (pork belly, mini-octopus, baby scallops, fish cake, enoki, seaweed, tofu and napa cabbage), they were fine except for the rubbery scallops. From there, we moved onto a more familiar broth in the Korean Bean Paste Soup. Hidden within the mildly spicy and salty broth and underneath the crown daisy was kimchi, fish, fish cake, pork belly, fish tofu, zucchini, mushrooms, seaweed and noodles. The best part was the aforementioned instant noodles (normally found in kimchi bowls) as they were chewy and had soaked up the broth. Heading into something more standard was the Beef Hot Pot. Naturally, this one had a distinct meaty flavour due to the raw beef cooking in the broth. There was a bit of spice from what tasted like satay seasoning which gave way to a sweet finish. I found the ample amount of beef to be buttery and tender while the one-half of a meatball was a bit chintzy. Other ingredients included bean curd skin, vermicelli, meatball, crab stick, tomato, tofu, enoki, fish cake and of course the napa cabbage. Next, we had one of the bigger deluxe hot pots in the Thai flavour ($4.00 premium). This was a bit sour and sweet with a touch of spice emulating a Tom Yum broth. 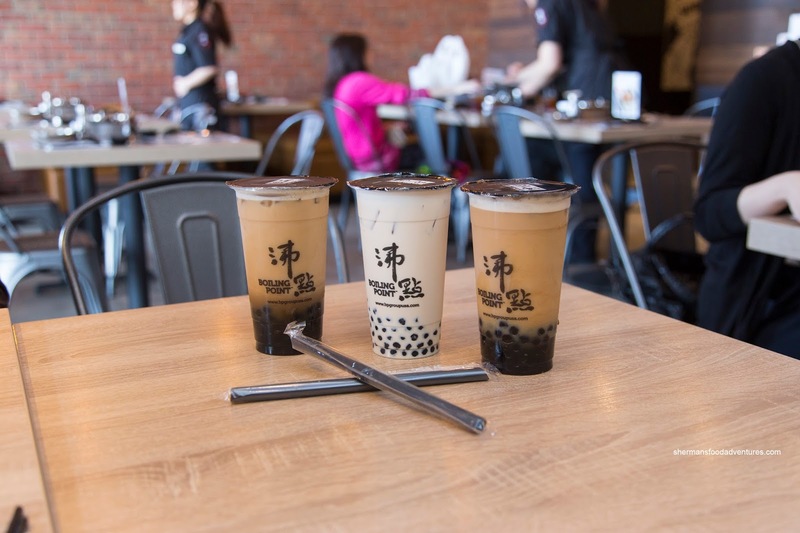 The Winter melon soaked up the sour notes as well as the napa cabbage. There was an array of seafood including head-on shrimp, clams, mini-octopus, fish ball, taro, squid and crab complimented by napa cabbage, enoki and maitake mushroom. 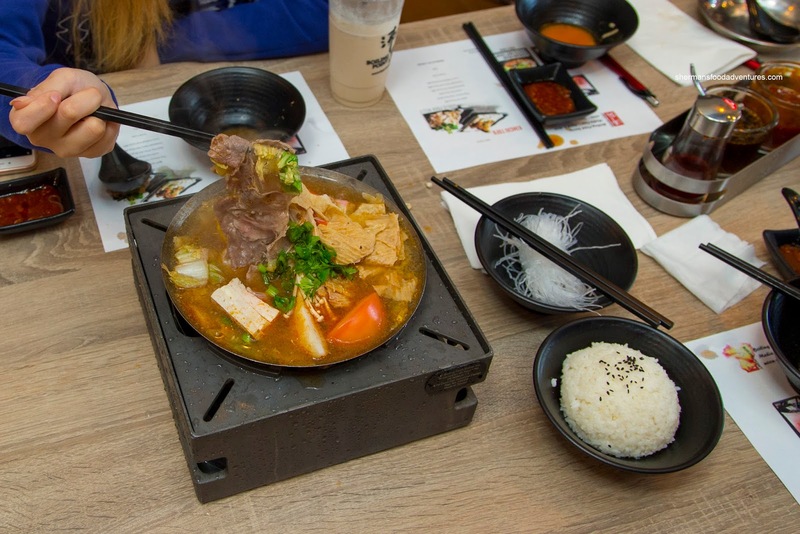 Continuing with the heat, we got the Lamb Hot Pot garnished with a raw egg on top. 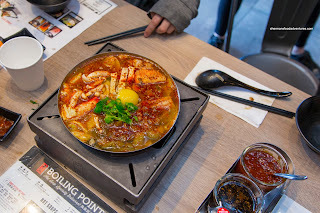 Despite the visuals, the broth wasn't actually super spicy. With that being said, it got progressively spicier as it boiled. The lamb slices were fatty and buttery, yet did not take on much flavour of the broth. Rounding out the hot pot was pork blood, cabbage, fish cake, vermicelli, crab stick, clam, pickled mustard greens, maitake and enoki mushroom and tofu. 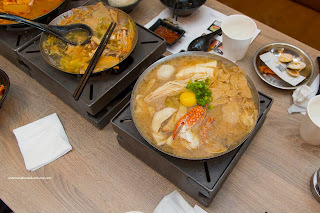 We continued on with a more mild hot pot in the Japanese Miso. Compared to the previous broths, this one was almost refreshing. We found it full of flavour yet not too salty at the same time. 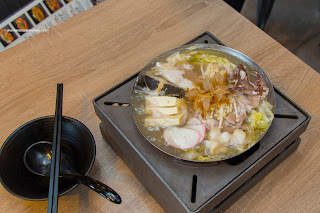 Although you cannot see much in the picture, the ingredients included cabbage, udon, sliced pork, enoki, clam, fish ball, fish, oyster mushrooms, crab, tofu skin, soft tofu and egg. Our last 2 consisted of the Curry Fish Ball and Spicy Taiwanese. As light as the broth appeared, the curry fish ball did exhibit curry-like flavours that was balanced off by an equal amount of sweet and savoury notes. This was not very spicy nor heavy on the curry. In addition to the fish balls, there was a raw egg, corn, tofu skin, cabbage, vermicelli, pork, enoki, crab stick, mountain yam and string beans. 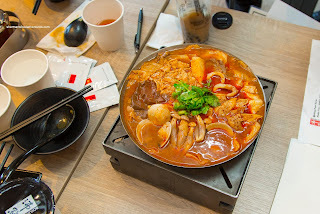 Ending off strong, the last hot pot was spicy as its name suggested. In fact, this was the spiciest of all with lingering heat. In addition to the thai and miso, this was also considered a bigger deluxe hot pot. 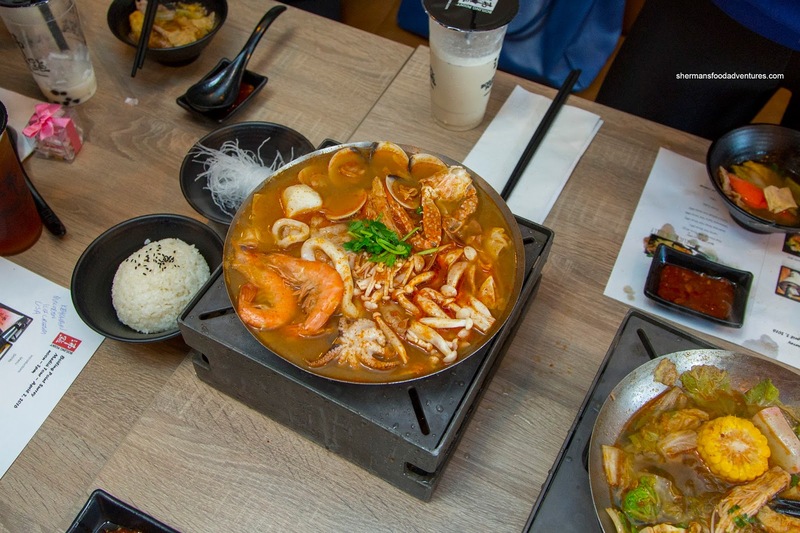 Hence, there was a bevy on ingredients including cabbage, instant noodles, beef, enoki, clam, fish ball, cuttlefish, pork intestine, pork blood, tofu skin, maitake and iced tofu. Now with all these boiling pots of broth and spiciness, we didn't only just drink water... For myself, I decided to try their Hokkaido Milk Tea with pearls. I only got it 1/4 sweet and it was plenty for my tastes. In fact, it allowed the rich aromatic tea to really shine. I would say this is one of the more intense tasting milk teas I've had of late. 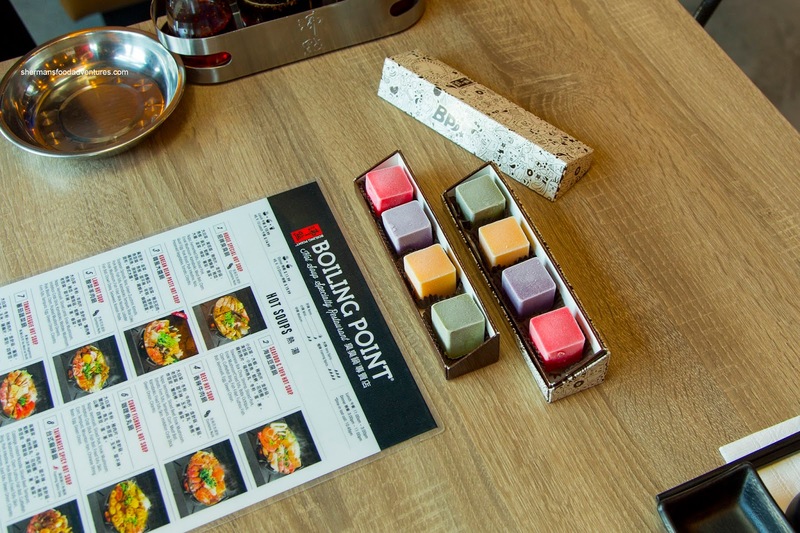 For dessert, we were served a selection of their Snow Cubes consisting of strawberry, taro, pudding and matcha. I ended up with the taro and it was subtly sweet with the essence of taro. The cube was firm and I ended up chewing it. Texturally, it was creamy and a bit gummy at the same time. 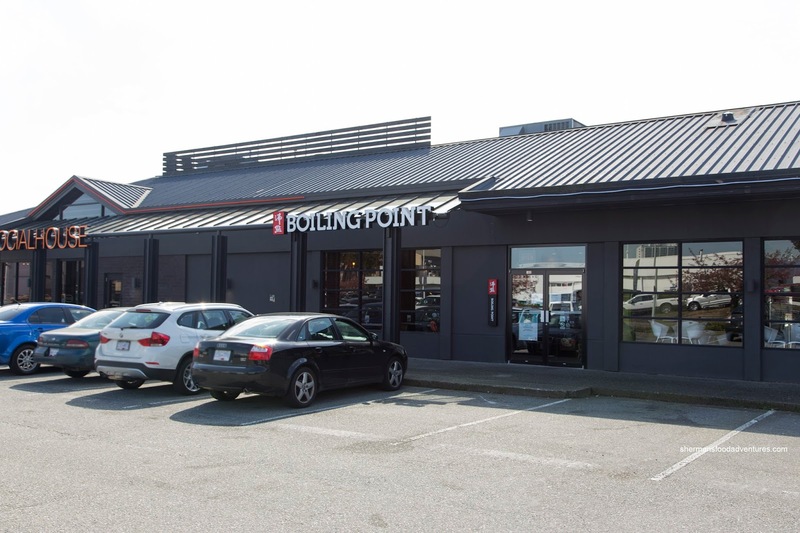 Unlike my previous visit to the Burnaby location, I was able to try nearly all of the broths available at Boiling Point. For me, I'm happy with the less expensive versions at $10.99 for lunch and $11.99 for dinner.